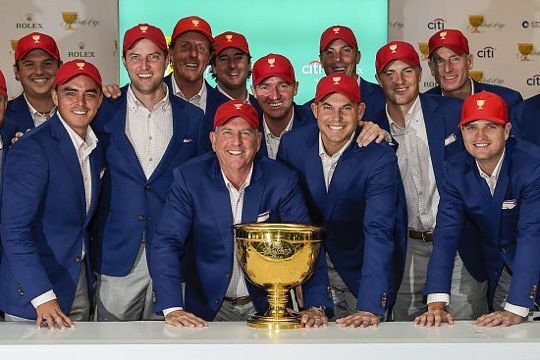 The United States won the Presidents Cup by one point against the International Team on Sunday, with the captain’s son and pick Bill Haas securing the winning point against home hero Sangmoon Bae in the final singles match on the 18th green. The 11th staging of the biennial team match play contest, held in Asia for the first time, went down the wire in front of large galleries at the Jack Nicklaus Golf Club Korea with Haas notching a thrilling 2-up victory which gave the US Team a 15½ to 14½ win, which was its ninth in the series and sixth consecutive success. It was indeed a day of high drama which saw some stunning matches leaving the outcome of the Presidents Cup on tenterhooks. The Internationals secured some big wins, with Marc Leishman edging world number one Jordan Spieth 1-up, Adam Scott trouncing Rickie Fowler 6&5 and Hideki Matsuyama beating J.B. Holmes 1-up with a birdie on 18. Branden Grace emerged as the star for the Internationals with a 2&1 win over Matt Kuchar giving him a perfect five wins this week. But with the Americans gaining wins through Dustin Johnson, Phil Mickelson, Chris Kirk and Zach Johnson and with half points from Patrick Reed and Bubba Watson, it all came down to the last tie between Haas and Bae. The local hero, who was an International pick, produced some gutsy shots, including par save on 16 from eight feet and a wonderful bunker shot on 17 to stay one-down. Needing to win the last hole, it ended in disappointment for the Korean star, a former Asian Tour multiple champion and a double winner on the PGA TOUR, as he fluffed his third shot to allow Haas to win the hole and match 2-up. International Captain Nick Price paid tribute to his 12 men, especially Bae and India’s Anirban Lahiri, whose three foot putt on the last green lipped out for a half point with Kirk which could have then offered a different ending. “For it to come down to just a couple of shots at the end of the day on Sunday make for incredible theatre,” said Price.